It all started with a kid in a Brisbane Lions jumper with Jason Akermanis’ number on his back, kicking the footy around at Auskick in Melbourne. Fast-forward 14 years, and Ben Keays could be about to forge his own career as a Brisbane Lions champion. “I was living in Melbourne until 2002, so my earliest footy memory is probably going to Auskick at four years old, wearing a Lions jumper. It’s just always been in my family since day one,” Keays said. After the Keays family packed up their belongings and headed north, Ben immediately found a home at the Morningside Football Club. “We went straight to Morningside, which was where I started playing Under 8’s. For the next 12 years I was a Morningside player. After pulling on the red, white and black, it didn’t take long for Keays to show how special a talent he was. “My first Queensland side was under 12’s school boys. That was the first time I represented Queensland, and from then on I was lucky enough to play for Queensland right up until this year in the under 18’s,” he said. 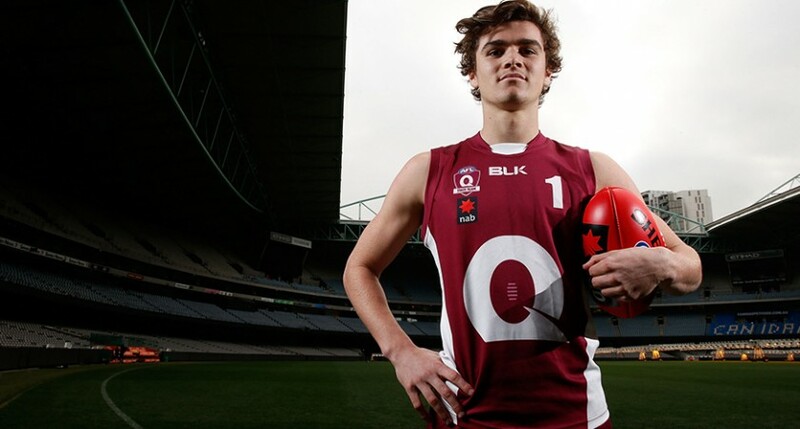 Keays was highly touted from the moment he pulled on the maroon jumper, but it wasn’t until 2014 that his stocks rose significantly. As a bottom age player in the Under 18 team, Keays made waves throughout the carnival, which led to him being selected in the All-Australian team. Despite such a standout carnival that really put him on the map, Keays wasn’t sure if he would even be playing in the lead up. “I didn’t even think that I was going to make the Queensland team that year. Every training session I was on edge, trying to work hard, and thought I would be lucky to play a couple of games. I got to play every game, and I loved every minute of it,” he said. He believes that was the catalyst for such a successful 2015. “It was huge, it just took so much pressure off the top age year. Having that as a back up, and a base, a bit of pressure was off so I could go out and enjoy myself,” Keays said. There weren’t too many boxes Keays didn’t tick in 2015. He captained the NAB AFL Under 18 Championships Division Two winning side, was awarded the Hunter Harrison Medalist as the player of the carnival, was named in the All-Australian team, was awarded Queensland’s Most Valuable Player, and picked up a NEAFL rising star nomination playing for the Lions. The carnival is something Keays already looks back upon very fondly. “When I’m asked about my favorite footy memory, that’s it, the Division Two winning team. The boys were so close, we are such good mates, it was an amazing week that I wont forget in a hurry,” he said. When he wasn’t running around for Queensland this year, Keays played a big role in the Brisbane Lions’ NEAFL midfield. That means he spent the majority of this year rubbing shoulders with, and learning from, some of the best in the business. “Its pretty incredible, especially being a Lions supporter. Catching up with Blacky, (Simon Black) who is the senior midfield coach, and knowing a couple of the players like Harris Andrews and Liam Dawson, being friends with those kind of guys, it is pretty incredible,” Keays said. Now, 18 days out from the draft, Keays can set his sights on the next chapter, which will hopefully see him land at an AFL club. Playing footy is the dream, it doesn’t matter where, Keays said. “I know every kid says that, but especially me being a footy lover and just wanting to be around the game, I will play anywhere if I have to,” he said. But, it would be nice to remain ‘home’. “Not having to move, being able to stay around the city with all my friends and family would be awesome,” he said. He believes three qualities in particular have got him to this point, and will help him take the next step. “I think my strengths are my work rate, competitiveness and footy IQ. Work rate being coming off the ground absolutely stuffed, competitiveness just scrapping for the footy, and footy IQ knowing where to go and getting to the right spots.” he said. Kids around Australia dream about playing a game of AFL, a moment Keays has thought about, but knows isn’t a certainty.